AES is happy to announce that we have an exclusive Middle East representative: Anzima. 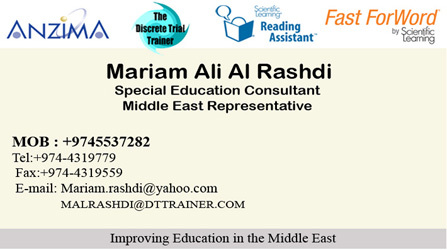 Mariam Al Rashdi of Anzima is spearheading the introduction of our educational software to the Middle East. This introduction will involve significant effort, and we appreciate her willingness to help us make an impact on children in the Middle East. Anzima offers support in Arabic and English and is setting up representatives in different regions to provide an excellent level of support and service. Anzima is introducing the English version of our first product, the DT Trainer. Since English is the second language of the region, we can start impacting learning immediately. The more significant impact will be with the Arabic version of the DT Trainer. Anzima plans to start creating an Arabic version of the product soon. They intend to use sales of the English version to help fund the creation of the Arabic version. Anzima will later introduce our second product, the Activity Trainer, and will work to develop an Arabic version of that program as well. Please understand that the introduction of the DT Trainer and our other products to the Middle East will involve significant costs and we will not be able to offer the same pricing as in the US. Our US pricing is due to the large population, large school districts, and a number of other factors. The Middle East price structure is designed to support the more expensive support service necessary for successful adoption of the tools in the area. However, even at these higher prices, our products represent a large value in what they can accomplish for our students. Mariam was introduced to the DT Trainer while she lived in Canada. She saw the tremendous progress that her son with Autism made using the program. She now wants to help other schools and families in the Middle East to have the same help that her son had. Again, we thank Anzima and Mariam Al Rashdi for their efforts in bringing our educational software to the children of the Middle East.